With Christmas just around the corner, Germany is getting more and more excited! Houses and house windows are being decorated, shops stocking up on christmas sweets and advents calendars. It’s a marvelous time of the year. Almost the only time of the year when gingerbread is available in this country of the world, so value it while you can!!! So, you cream together the butter with sugars, then add the egg, mixing until incorporated. Then add the yolk, and mix again. Then come all the other ingredients and combine well. In case the dough has a runny consistency, you can add more flour. However, brear in mind that the dough will be soft – you have to keep it that way. You know the consistency is right, when it will not stick to your fingers, when you touch it. It wouldn’t take you more than 2 tablespoons of flour (at most) to reach this. Beat the egg white until it’s broken up, and runny. I added 1 tablespoon of water to it also, while beating it. Take walnut sized pieces of the dough and shape them into balls. Then roll them in the egg white, then in the chopped almond, and place them on a baking sheet. When you finished will all the balls, wet your finger (I used my index) and press it into each ball’s center, to form something like a well. Try not to poke through the cookies, otherwise your jam might run out from it. 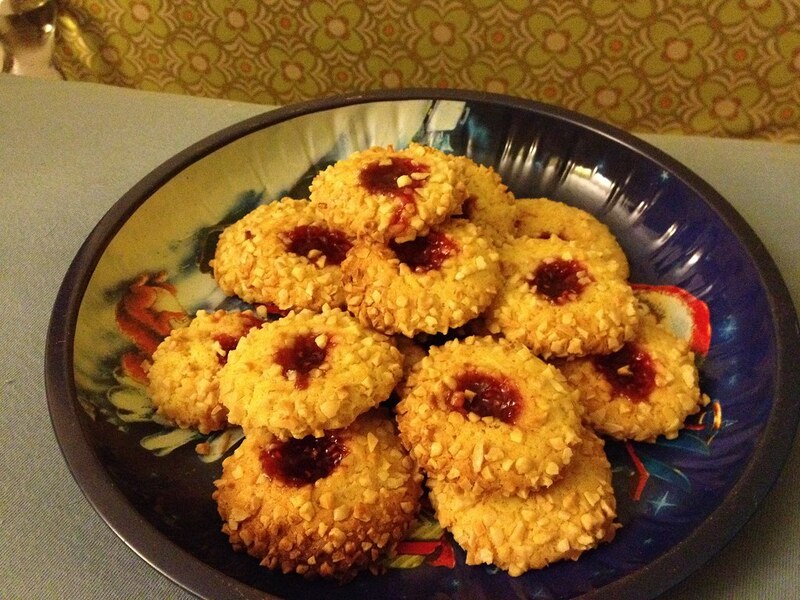 Fill a piping bag with the jam, and fill the holes in the cookies with it. Only to the top, not overflowing, otherwise if will run down on the side of the cookie, get burned, and … well, you can imagine the rest. Note: the jam will become runny, as you hold the piping bag in your hands, so be careful with it! 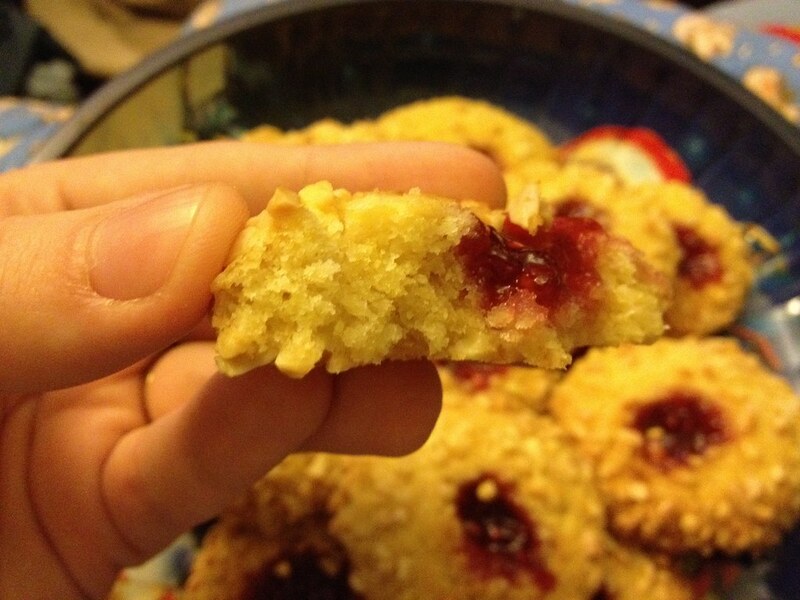 Put the cookies in the oven, preheated to 150 C, and bake them until the sides start turning golden brown, and the jam in the middle is bubbling. The only thing that didn’t work out as shown in the magazines picture, is that my cookies were rather flat, while the ones in the magazine kept about 75% of their original shape. Maybe the dough wasn’t the right consistency? Maybe my cookies were too big? I don’t know. But I do know that these little ones will be on my Christmas table. Oh, and one more thing. You might get tempted, as I was, to skip the egg white coating, and just roll the cookies in the chopped almonds, because the dough is “sticky enough”. Don’t!!! Even though they will stick to it, and it will look nice, the moment you touch them, they will fall off (after baking I mean). That’s what the egg white is there for: super GLUE! So, I hope you give it a try. I found many other places, where you can find recipes for this kind of cookie (Martha Stewart‘s website, or a video by Joy of Baking just as an example). This entry was posted in Baking, Christman baking. Bookmark the permalink.